The Golden Egg Academy is currently running a month-long hashtag conversation about kidlit. It’s tremendous fun, and you don’t have to be affiliated with the GEA to participate (I hadn’t heard of them before I saw people liking and retweeting some of these posts). A recent prompt asked participants about the best writing advice they’d ever received. I’ll talk about that next time, but today I want to post about the best writing insight I’ve ever stumbled upon by myself, thanks to a beautifully executed example of how to do it right. At the same time, it’s understandable that the protagonist of a spec fic story doesn’t know that she’s the protagonist of a spec fic story. In real life, most of us would giggle nervously and make a few jokes if there were an outbreak of Neck-Rupture Anemia in the neighborhood, but we wouldn’t put up the crosses and garlic, and we certainly wouldn’t go out hunting with stakes and mallets. How can we set up a mystery like this for our protagonist–“is it really a vampire, or am I crazy?”–that doesn’t make the reader irritably point to the word “horror” on the back cover? When you set up a problem like this, you’re putting your character at a narrative fork in the road. The trouble is that in mediocre stories, one of the paths leads to an interesting, twisty ramble through an exotic forest and the other leads to a dead end. There needs to be a compelling alternative for what’ll happen if Neck-Rupture Anemia really is just a disease or if Grandpa’s fairy tales really were just an old man spinning yarns; that way, the reader will see that both paths actually go somewhere. How to go about doing this? The first time I noticed a well-executed narrative fork in the road was the movie The History of Violence. (I haven’t read the graphic novel, but I’ve heard that it’s completely different.) If you haven’t seen it, you should; I won’t spoil it here beyond laying out the basic premise. 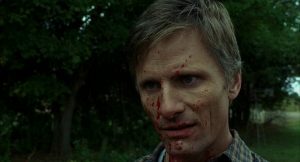 Viggo Mortensen plays Tom Stall, a restaurant owner and father of two in Indiana. When a pair of thugs try to rob his restaurant, most of the staff and customers freeze in terror, but Tom quickly kills them and is hailed as a local hero. It seems like a happy ending . . . until a mobster from Philadelphia rolls in, claiming that he saw Tom on the news and recognized him as his old mob buddy Joey Cusack. Tom and his wife vehemently deny this, but the mobster continues to stalk and threaten the Stall family, claiming he won’t leave them alone until Tom (Joey?) returns to Philadelphia with him. I spent the first half of this movie on the edge of my seat–because I had no idea what movie I was watching. Was this the story of a Joey Cusack, a repentant mobster who had escaped the criminal world and tried to make a new life, only to learn that violence and the past would always find him? Or was it the story of Tom Stall, an innocent man mistaken for a murderer, who commits a single, justifiable violent act and finds that it will lead to more violence and bloodshed, possibly transforming him into the killer he just happens to resemble? Is this the face of an innocent man who can’t believe he’s become a killer, or a killer who can’t believe his past has caught up with him? I would watch the heck out of other of those movies. 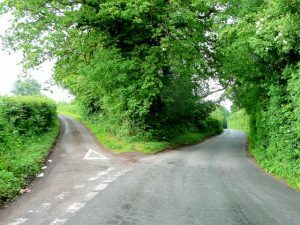 Both are compelling stories–the fork in the road leads to two paths that each look like a terrific hike. What’s more, both are consistent with the tone and theme of the movie so far–a dark film that studies both the allure and the destructive effects of violence. It isn’t like we’ve been walking along a dark and eerie trail, and our two choices are either a similarly spooky path or a delightful sunlit ramble. I want to give David Cronenberg and Josh Olson a standing ovation for this one. The 2015 UK horror movie The Hallow has a similarly well-done narrative fork in the road. I won’t spoil the ending, but I can’t talk about it without getting into some third-act plot developments. It’s on Netflix streaming and is quite decent; if you want to go in completely unspoiled, either watch it and come back in two hours or skip to the next paragraph. A couple and their baby are being terrorized by old-school evil fairies, and like any self-respecting old-school evil fairies, they have a history of stealing children and replacing them with changelings. The husband, Adam, is convinced that they’ve stolen and replaced baby Finn, and we know they had the opportunity to do so . . . but Adam got hit by a glamour earlier in the movie. His wife is positive that the baby is their own and that Adam is being influenced by the glamour. Are the fairies manipulating this poor sap into killing his real child, or into giving the real child to them in the mistaken belief that he’s returning a changeling? Or is the glamour allowing him to see fae things for what they really are, turning him into a tragic Cassandra-like figure who can’t make his wife see that she’s clutching a viper to her bosom while abandoning their real child? Again, those are both spectacular stories, and they’re both a solid tonal and thematic match for what’s come before. You might not want to hold that baby so close. Or maybe you want to hold him even closer. Who knows? Either of these movies could have been one of those eye-rolling affairs where everyone knows what’s coming except the characters. If the Philadelphia mobster hadn’t been a direct threat to Tom Stall’s family, it would have been clear that Tom was Joey Cusack–otherwise, there would have been no story, because Tom could have rolled his eyes and ignored the guy. If the mobster mistook him for something innocuous, like an honest citizen who’d seen his crimes and been placed in witness protection, it would have been clear that he was Tom Stall–otherwise, there’d be no compelling reason for him not to come clean to his family about his identity, and again, no story. There are a hundred ways The Hallow could have been a snoozefest as well–I won’t get into details so we don’t have another spoileriffic paragraph, but let’s just say that it would have been a disaster to have that same setup at the beginning of the movie instead of in act three. I can’t see any way that they could have maintained the mystery that long., and eventually it would have been clear which character was careening toward a dead end. Do you have any stories where you were at the edge of your seat, not knowing what story you were reading and watching? What about thoughts you’ve had for how to make these “it’s obviously a vampire” stories more compelling? This entry was posted in Horror, Spec fic, Writing. Bookmark the permalink.